Seasonably mild temperatures will continue this week in Winnipeg, continuing a slow and steady spring melt across the region. A potent upper-level ridge building into the Prairies will send another push of warm air across the region. A weak disturbance will push a warm front through the region today, bringing Winnipeg plenty of cloud cover. That same front will bring the city a chance for some afternoon flurries. Temperatures will climb to a high near +1°C with winds out of the south near 20 km/h. Skies will stay mostly cloudy tonight with a low near -4°C and light winds. Tuesday will bring mostly cloudy skies to the region with westerly winds climbing into the 20 to 30 km/h range. Winnipeg will see a high near +3°C. The cloud cover should breaking up in the evening as temperatures head to a low near -3°C. Those westerly winds will ease overnight. On Wednesday, weather systems finally leave the region alone with just a weak surface ridge1 working into western Manitoba. 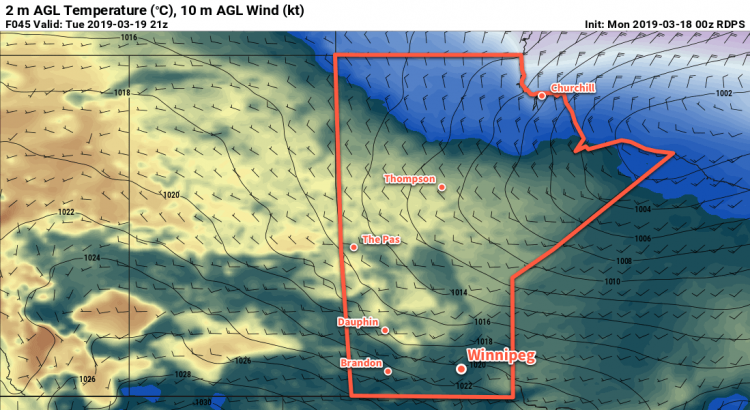 This will give Winnipeg light westerly winds with temperatures climbing to a high near +3 or +4°C. The city will see mixed skies, which means it will be the first day of the next few to offer the potential for lots of sunshine. If the sun does make an appearance, it will likely result in a large range of temperatures across the city. The high of +3°C is for the weather station at the airport, which is in the middle of a snow-covered field. Areas of the city that have more buildings, or have much of the snow cleared and/or melted already will likely see temperatures climb higher, potentially up to +7 or +8°C. Temperatures will head to a low near -2°C on Wednesday night with clearing skies. The rest of the week is looking great; the upper ridge will bring benign weather to the region! Winnipeg can expect a fair amount of sunshine, light southerly winds, and daytime highs in the +4 to 8°C range! This also means that milder temperatures will spread south of the border. The region will be moving into the spring flood season over the next couple weeks. As it does, flood water will begin weakening ice cover on rivers and lakes. Remember to exercise caution around frozen waterways. Today’s seasonal daytime high in Winnipeg is 0°C while the seasonal overnight low is -11°C.